A criminal case has been opened into the murder of Russia's former first deputy prime minister, shot late at night on Feb. 27 while walking near the Kremlin. Russian Investigative Committee committee spokesman Vladimir Markin told Interfax news agency Saturday that a criminal investigation has been opened into the murder of opposition leader and former deputy prime minister Boris Nemtsov. "The Russian Investigative Committee's main investigations department for Moscow has opened a criminal case under Russian Criminal Code Articles 105 (murder) and 222 (illegal trafficking in arms)," Markin said. According to Markin, unidentified killers fired "at least seven or eight shots" at [Russian opposition leader Boris] Nemtsov as he was walking on the Bolshoy Moskvoretsky Bridge near the Kremlin on Friday night, Feb. 27. He added that the most experienced investigators and criminologists from the central office of the Russian Investigative Committee have been assigned to the investigation at the request of the head of the committee. Investigators are consdiering a wide range of theories for the murder. Yulia Ivanova, a spokesperson for the Moscow department of the Russian Investigative Committee said. "Every theory is being looked into, including a contract killing," Ivanova said. Russian Interior Minister spokesperson Yelena Alexeyeva told reporters: "Nemtsov was walking along the Bolshoy Moskvoretsky bridge with a female citizen of Ukraine. He was shot from a passing car." She added that he sustained four wounds and that six shells were found at the scene. The type of gun used in the murder will be established in ballistic tests, she said. "Investigators are working with a woman who was with Nemtsov when he was killed. Psychologists of the Emergency Situations Ministry arrived to offer her necessary assistance," she said, noting that agency head Vladimir Kolokoltsev is overseeing the investigation. An Interfax source with contacts in Russia's law enforcement agencies said that investigators have already received valuable information from CCTV cameras at the scene. The cameras recorded three white cars, two Ford Focus and one Ford Mondeo, driving on the bridge at the time of the murder. The license plates of the cars have already been established, the source said. Witnesses to the crime, however, said that the car from which the shots were fired had no license plates. Putin's press secretary Dmitry Peskov is certain that Nemtsov's murder is a provication. "Now it is too early to make any conclusion on the death of Boris Nemtsov, but one can be 100 percent sure that this is a provocation," Peskov said in an interview with television channel RT. "It is a provocation in the sense that it is absolutely clearly known that Boris Nemtsov is in opposition to the Russian authorities, that he is in opposition to the line that the Russian leadership pursues," Peskov said in an interview with the Kommersant FM radio station. 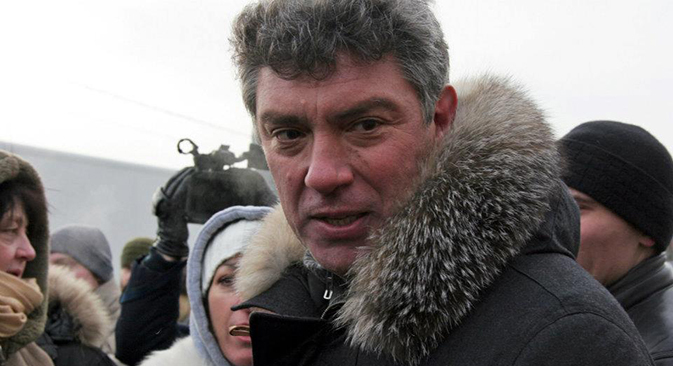 Nemtsov had "rather tights contacts with various people in Kiev. He went there often. This is not a secret; everybody knows that," Peskov said. "And against the backdrop of the events that the opposition plans in the next few days, against the backdrop of such an emotional and tense atmosphere that we have, given events in Ukraine, this can surely be a provication." Peskov said that Nemtsov did not pose a threat to the Russian leadership. "With all respect to Boris Nemtsov, he did not pose any threat in the political sphere for the incumbent Russian authorities and for Vladimir Putin. If we compare the level of popularity and ratings of Putin and the governemnt on the whole, then in general, Boris Nemtsov was quite an average citizen," Peskov said. The source with law enforcement agencies also suggested that the murder of Nemtsov may be a provocation. "What is noteworthy is the fact that Nemtsov was killed in the run-up to an opposition march scheduled for March 1. The crime could be an act of provocation," the source said. Law enforcement agencies are looking into various theories behind the murder of Nemtsov. "Of course theories related to Nemtsov's political activity, his work as a deputy in the Yaroslavl region parliament, are looked into," another source with law enforcement agencies told Interfax. "A theory of personal enmity is also under consideration." Nemtsov had recieved threats on social networks, said Vadim Prokhorov, a lawyer for Nemtsov's family. "Several months before today, threats were made on social networks. We filed an application [with police] but there was no reaction," Prokhorov told Interfax. Prokhorov said that Nemtsov had recieved death threats, although he added: "Let me underscore that this was several months ago." Meanwhile, according to a source with law enfrocement agencies, Nemtsov made no complaints to police about death threats. The murder of Nemtsov sparked a broad public outcry both in Russia and Western countries. In particular, Putin and U.S. President Barack Obama both expressed their condolences over the murder. "We offer our sincere condolences to Boris Efimovich's family, and to the Russian people, who have lost one of the most dedicated and eloquent defenders of their rights," read a statement issued by the White House. Condolences also came from Prime Minister Dmitry Medvedev, his press secretary said. Sergei Neverov, a deputy speaker of the Russian State Duma from the United Russia party, also expressed his condolences over Nemtsov's murder. "I express condolences to all relatives and friends of Boris Nemtsov. I knew him personally as a deputy prime minister in charge of the energy sector, as a State Duma member, as an incumbent deputy of the Yaroslavl region duma. This is an insolent crime committed in downtown Moscow. We, members of the State Duma, will closely follow the investigation," the press service of the United Russia party quoted Neverov as saying. Former Yukos CEO Mikhail Khodorkovsky also expressed pain over the murder. "The death of Boris grieves me and my family. We all loved him. A crazy but a very good guy," Khodorkovsky tweeted on Saturday night.